iMacros for Firefox (version 10 and above) is one of the iMacros Webextensions. A detailed documentation of features and limitations is found in that page. Here we document the few differences to that common page. For the legacy versions (9 and below) refer to iMacros for Firefox Legacy. If you have iMacro File Access installed you can use the ONDOWNLOAD command to automate the download of files in Firefox. 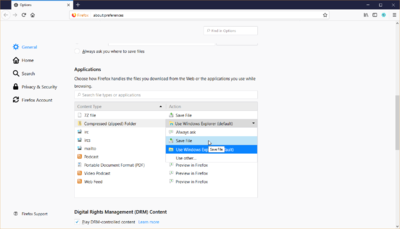 If the File Access is not installed, the ONDOWNLOAD parameters are ignored but the file is downloaded with its default file name, to Firefox default downloads folder. However, by default, Firefox will prompt you to choose between saving or opening a file upon download. iMacros cannot handle this prompt and will only be able to download the file if Firefox default action for this file type is Save File. If the file type you are downloading is not listed under Content Type, you will have to edit Firefox handlers.js file manually. In the example below we included .exe and .msi in handlers.json, using "action":0 for save. To locate the handlers.json file, type in Firefox navigation bar "about:support" and under General Information/Profile Folder you can click on the button Open Folder. When you clear the browser history in Firefox, iMacros stored data is also removed. Thus all your iMacros preferences are lost. iMacros will work again, but you preferences will be reset to their defaults. This also happens if you set Firefox to Clear history when Firefox closes in about:preferences#privacy. The CLEAR command, on the other hand, does not delete iMacros data, while clearing cache and cookies. It also accepts an argument to filter the cookies to be cleared by domain name. Using CLEAR with no argument clears all cookies and cache. Using e.g. then you will need to copy and overwrite the following dlls first before this functionality will work with the current version of iMacros for Firefox. This is not required if you are already using a newer version of iMacros Enterprise (newer than v12.0) or if you are not using -fxProfile. Docking the iMacros panel (sidebar) can break the ability to drag and drop tabs in Firefox. Search and replace dialog no longer work in the macro editor due to Firefox CSP (Content Security Policy) for Web Extensions. This is the first version which supports Firefox Quantum (Firefox 57 and above). It is a complete new version for the Firefox Webextension API, which has more similarities with iMacros for Chrome than previous versions of iMacros for Firefox. In particular, there are some commands, variables, and functionality that were previously supported but currently are not mostly because the WebExtension API provided by Mozilla still lacks support for it. The imacros://run/ URI is no longer supported for running macros from the command line, however, a new method is described here. This page was last modified on 4 December 2018, at 13:52. This page has been accessed 3,617,432 times.